Boca Raton (/ˌboʊkə rəˈtoʊn/; Spanish: Boca Ratón, pronounced [ˈboka raˈton]) is the southernmost city in Palm Beach County, Florida, United States, first incorporated on August 2, 1924 as “Bocaratone,” and then incorporated as “Boca Raton” in 1925. The 2015 population estimated by the U.S. Census Bureau was 93,235. However, approximately 200,000 people with a Boca Raton postal address reside outside its municipal boundaries. Such areas include newer developments like West Boca Raton. As a business center, the city also experiences significant daytime population increases. It is one of the wealthiest communities in South Florida. Boca Raton is 43 miles (69 km) north of Miami and is a principal city of the Miami metropolitan area, which was home to an estimated 6,012,331 people at the 2015 census. Residents of the city have kept the pronunciation of Boca Raton similar to its Spanish origins. In particular, the “Raton” in “Boca Raton” is pronounced as /rəˈtoʊn/ instead of /rəˈtɑːn/. The latter is a common mispronunciation by non-natives to the region. The area today known as “Boca Raton” was originally occupied by the Tequesta tribe, a Native American people that occupied an area along the southeastern Atlantic coast of Florida. The area remained largely uninhabited for long afterwards, during the early years of Florida’ incorporation in the United States. The first significant European settler to this area was Captain Thomas Moore Rickards in 1895, who resided in a house made of driftwood on the east side of the East Coast Canal, south of what is now the Palmetto Park Road bridge. He surveyed and sold land from the canal to beyond the railroad north of what is now Palmetto Park Road. Early settlement in the area increased shortly after Henry Flagler‘s expansion of the Florida East Coast Railway, connecting West Palm Beach to Miami. Boca Raton as a city was the creation of architect Addison Mizner. Prior to him, Boca Raton was an unincorporated farming town, population 100 in 1920::7 twelve families. Mizner’s Administrative Buildings, which still stand. Instead of the existing Palmetto Park Road, the main street in Mizner’s Boca was to be El Camino Real, which Mizner fancifully translated as “The Royal Highway”,:39 referring to Spain’s road network and to the road to Santa Fe and to the Spanish missions in California. (Spanish kings rarely or never travelled on these roads; “The Government Road” would be just as accurate.) It was originally to be circular, with a lagoon in the middle. :44 Soon it became, in the plans, Boca Raton’s main east-west street, to be 220 feet (67 m) wide and with a canal for pleasure boats in the center. (In the drawing of it on the cover of Mizner Development’s first brochure is a Venetian gondola.) His statement that it was inspired by Botafogo, a neighborhood and beach in Rio de Janeiro, Brazil, apparently refers to Guanabara Bay, and implies that this was to be a salt-water canal (like those of Venice, Italy), connected to the Intracoastal Waterway on the east, moving with tides, and dead-ending to the west at the planned Ritz-Carlton Park. :144 However, Mizner freely invented unverifiable foreign “facts” about his projects, so it is also possible that Mizner, who never went to Brazil nor knew Brazilians, simply made it up because the name “Botafogo” (“mouth of fire”) sounded impressive, as was the concept of imitating Rio de Janeiro. There is no street in Rio de Janeiro anything like the picture of “Botafogo” Mizner distributed. Mizner was designated Boca Raton’s town planner shortly after its incorporation in 1924.< Mizner designed Boca’s first town hall/police station/fire station/library, although the design actually built is much smaller and less expensive than what Mizner planned. Today (2018) it is the Boca Raton History Museum, which houses Boca’s Welcome Center and the Boca Raton Historical Society. His Ritz-Carlton Cloister Inn was built in 1926, later renamed the Boca Raton Resort & Club, and is one of the only “5 star” hotels in Florida. The 1969 addition of its “pink tower” hotel building is visible from miles away as a towering monument on the Intracoastal Waterway. During World War II, much of their land was confiscated and used as the site of the Boca Raton Army Air Force Base, a major training facility for B-29 bomber crews and the only facility in the U.S. training radaroperators. Much of the Boca Raton Army Airfield was later donated to Palm Beach County and became the grounds of Florida Atlantic University. Many of FAU’s parking lots are former runways of the airbase. When viewed from above, the site’s layout for its previous use as an airfield is plainly evident. Boca Raton Airport‘s runway was once part of the original airbase, and is still active to this day, although the runway has been rebuilt. Army School Building #3 (T-604) of the Army Air Forces Base has survived as the office building for the Cynthia Gardens apartment complex on Northwest 4th Avenue. Boca Raton was the site of two now vanished amusement parks, Africa U.S.A. (1953–61) and Ancient America (1953–59). Africa U.S.A. was a wild animal park in which tourists rode a “Jeep Safari Train” through the park. There were no fences separating the animals from the tourists. It is now the Camino Gardens subdivision one mile west of the Boca Raton Hotel. A red wooden bridge and remnants from the Watusi Geyser and Zambezi Falls, a 30-foot waterfall, from Africa USA can still be seen at the entrance to Camino Gardens. Ancient America was built surrounding a real Native American burial mound. Today, the mound is still visible within the Boca Marina & Yacht Club neighborhood on U.S. 1 near Yamato Road. The Boca Corporate Center & Campus was originally one of IBM’s research labs where the IBM PC was created. Construction of IBM’s main complex began in 1967, designed by Marcel Breuer, and the manufacturing and office complex was dedicated in March 1970. The campus was designed with self-sufficiency in mind and sported its own electrical substation, water pumping station, and rail spur. Among other noteworthy IT accomplishments, such as the mass production of the System/360 and development of the Series/1 mainframe computers, IBM’s main complex was the birthplace of the IBM PC, which later evolved into the IBM Personal System/2, developed in nearby Delray Beach. Starting in 1987, IBM relocated its manufacturing for what became the IBM PC division to Research Triangle Park in Raleigh, North Carolina, and converted the cavernous manufacturing facilities into offices and laboratories, later producing products such as the OS/2 operating system and VoiceType Dictation, later known as ViaVoice voice-recognition software. IBM maintained its facilities in the South Florida area until 1996, when the facility was closed and sold to Blue Lake Real Estate, who in turn sold it to T-REX Management Consortium, then Blackstone Group bought the site in 2005 and renamed it the Boca Corporate Center & Campus. Today, this office complex area has revitalized the facility and its surrounding real estate into a business/research park. What used to be IBM’s Building 051, an annex separated from the former main IBM campus by Spanish River Boulevard, was donated to the Palm Beach County School District and converted into Don Estridge High Tech Middle School. It is named after Don Estridge, whose team was responsible for developing the IBM PC. IBM returned in July 2001, opening the software development laboratory at Beacon Square off Congress Avenue. Pearl City is a neighborhood in Boca Raton, immediately north of downtown. The neighborhood was originally platted on May 30, 1915 for the blue-collar African Americansemployed at the Boca Raton Resort and similar establishments, on area farms, in construction, and various other jobs. The Mayor of Boca Raton has been chosen through a direct election since 1978. The offices of the city council and the mayor are nonpartisan, but there are three Republicans and two Democrats on the Council. Mayor Susan Haynie, Deputy Mayor Jeremy Rodgers, and Council Member Scott Singer are Republicans. Council Members Andrea Levine O’Rourke and Robert S. Weinroth are Democrats. The previous mayor was Republican Susan Whelchel. As of February 2013, Democrats Lois Frankel and Ted Deutch both represent parts of the city in the United States Congress. According to the United States Census Bureau, the city has an area of 29.1 sq mi (75.4 km2), of which 27.2 sq mi (70.4 km2) of this is land and 1.9 sq mi (5.0 km2) of it (6.63%) is water. 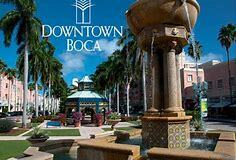 Boca Raton is a “principal city” (as defined by the Census Bureau) of the Miami metropolitan area. Approximately 1 sq mi is on the barrier island Deerfield Beach Island(DBI), also colloquially known as Deerfield Cay. Like other South Florida cities, Boca Raton has a water table that does not permit building basements, but there are several high points in the city, such as 4th Avenue which is aptly named “High Street.” The highest point in this area is the guard shack at Camino Gardens, which is 24 ft (7.3 m) above sea level. The Boca Raton Hotel’s Beach Club rests at 23 ft (7.0 m) above sea level. Boca Raton’s climate qualifies as a tropical rainforest climate (Köppen climate classification Af), as its driest month (December) averages 62.5mm of precipitation, narrowly meeting the minimum standard of 60mm in the driest month needed to qualify for that designation. In general the climate is warm and sunny much of the year, although daily thundershowers occur in the hot season from June through September. Boca Raton is frost free. The warm tropical climate supports the growth of tropical trees and plants. In 2000, the city’s age distribution was as follows: 18.9% under the age of 18, 8.1% from 18 to 24, 26.4% from 25 to 44, 26.7% from 45 to 64, and 19.8% who were 65 years of age or older. The median age was 43 years. For every 100 females there were 95.1 males. For every 100 females age 18 and over, there were 92.8 males. Boca Raton was home to the Wick Theatre & Costume Museum. The Caldwell Theatre Company, which closed in 2012, was the longest-running professional theater in South Florida, celebrating its 34th season in the recently[when?] inaugurated Count de Hoernle Theatre on South Federal Highway. The Boca Raton Bowl is a National Collegiate Athletic Association (NCAA) sanctioned Division I college football bowl game that features the Mid-American Conference(MAC) facing off against an opponent from the American Athletic Conference (AAC) or Conference USA (C-USA) in alternating years. Each conference participates four times during the six-year agreement, which began with the 2014 season. The Bowl is held at the FAU Stadium. Boca Raton hosts one of the largest Greek Festivals in southern Florida during the last weekend of January on Yamato Road. Tens of thousands of people come to sample authentic Greek Food while watching Greek Dancing. One lucky person each year even wins a brand new luxury car. Additionally, the town hosts the “Festival of the Arts BOCA” annually during the spring, and the Brazilian Beat Festival in the fall. Mizner Park is a lifestyle center in downtown Boca Raton. The area contains several stores and fashion boutiques, restaurants, an iPic movie theater, and housing. The Center for the Arts at Mizner Park is on the development’s north end, which includes the Boca Raton Museum of Art and the Count de Hoernele Amphitheater. Boca Raton’s eastern coast has two miles of beaches, notably Red Reef Park and South Inlet Park. As of 2007, Boca Raton was served by four public high schools. Within the city’s limits, Boca Raton Community High School serves the eastern part of the city. Spanish River Community High School serves the west-central part of the city limits and parts of unincorporated Boca Raton. Olympic Heights Community High School serves the western unincorporated areas. Finally, West Boca Raton Community High School serves the far-west unincorporated areas. Spanish River, Olympic Heights, and West Boca Raton also serve students from Delray Beach and Boynton Beach. The area is served by five public middle schools. Don Estridge High Tech Middle School is a technology magnet school named for Don Estridge, the leader of a small group of engineers who developed the IBM Personal Computer in Boca Raton. The other four public middle schools are Boca Raton Community Middle School, Eagles Landing Middle School, Loggers’ Run Community Middle School, and Omni Middle School. FAU High School is a dual-enrollment program that involves itself primarily in collegiate classes. Students in ninth grade take advanced classes at the ADHUS sister campus, while students in higher grades attend only collegiate classes on Florida Atlantic University’s campus, earning dual credit for both high school and college. A student who has successfully completed all four years at FAU High School will graduate having completed three years of university study on a college campus. Pope John Paul II High School is a Catholic schoollocated in Boca Raton. Digital Media Arts College, founded in 2001, offers bachelor’s and master’s degrees in computer animation and graphic design. The Boca Raton Public Library serves city of Boca Raton residents. A second municipal library building on Spanish River Boulevard west of I-95 was opened in January 2008. The Glades Road Branch Library and the West Boca Branch Library of the Palm Beach County Library System serve Boca Raton residents who live outside the city limits. The West Boca Branch opened on February 20, 2009. It is on State Road 7 just north of Yamato Road. The Glades Road Branch Library, formerly known as the Southwest County Regional Library, is on 95th Street and Glades Road, between Lyons Road and State Road 7. It closed for renovations in early 2009 and reopened as the Glades Road Branch Library on May 29, 2010. County library card holders may use any of the sixteen branches in the Palm Beach County Library System and have access to many databases and downloadable e-books and audio books. Boca Raton has a connection to the Mafia. It is known as a popular hangout for many suspected Mafia members. According to a number of US Federal indictments, as of June 2004, the Gambino familycontinues to operate in Boca Raton. The television show The Sopranos featured the city in its plot (“Boca” and “…To Save Us All From Satan’s Power“), and Mafia Wife author Lynda Milito resides in Boca Raton. Joey Merlino, the reputed head of the Philadelphia crime family, also resides in northern Boca Raton. In 2007, several murders at the Town Center Mall gained national attention. In March, a 52-year-old woman was kidnapped and murdered. In December of the same year, a 47-year-old woman and her 7-year-old daughter were also kidnapped, and later found bound and shot in the head in the woman’s SUV in the mall parking lot. This case was featured on America’s Most Wanted and caused host John Walsh to say he believed a serial killer to be in the city. Though there is no forensic evidence to suggest the murders were committed by the same person, the similarities in the cases led police to believe they were related. To this day, the murders all remain unsolved. The Boca Raton Airport (BCT) is a general aviation airport immediately adjacent to Florida Atlantic University and Interstate 95. It has a control tower which is manned from 0700 to 2300. The Boca Raton Airport is publicly owned and governed by a seven-member Authority appointed by the City of Boca Raton and the Palm Beach CountyCommission. U.S. Highway 1, locally known as “Federal Highway”, is a north-south highway passing through the city’s downtown, commercial, and industrial districts in the eastern part of the city. Florida’s Turnpike is a north-south highway passing through unincorporated Boca Raton, forming part of the city limits in the north, with one interchange at Glades Road. Long before any settlers arrived, the original 1870 government survey of the area showed that just west of and parallel to the Atlantic Ocean‘s coastal dune was the “Boca Ratones Lagoon”, which extended south for nine miles (14.5 km) measured from just north of the present location of Atlantic Avenue in Delray Beach. Along the southern half of the lagoon were three wide areas each called a “Lake”, which are now named (north to south) Lake Rogers, Lake Wyman, and Lake Boca Raton. At the southeast end of the lagoon was a short protrusion toward the south which would become the Boca Raton Inlet after a sandbar at its mouth was removed. The lagoon and lakes were part of a half-mile (0.8 km) wide swamp, west of which was scrub land a mile (1.6 km) wide (part of the Atlantic coastal ridge) where the Florida East Coast Railway (1896) and Dixie Highway (1923) were built. To the west of the scrub was a half mile or wider swamp within which flowed north to south the “Prong of Hillsborough River”, which is now the El Rio Canal. It now forms the eastern border of Florida Atlantic University and the Old Floresta neighborhood. The prong entered the “Hillsborough River” at the present eastern end of the straight portion of the Hillsboro Canal (dredged 1911–14), which is the southern city limits. The river flowed southeast in several channels along the western edge of the present Deerfield Island County Park, formerly called Capone Island (named for Al Capone who owned it during the 1930s), which did not become an island until the Royal Palm Canal was dredged along its northern edge in 1961. Flowing south from the lagoon to the river along the eastern edge of the ‘island’ was a “Small boat Pass into Hillsboro’ River”, also called the Little Hillsboro. The river continued due south about four and a half miles (7.2 km) just inland of the coastal dune until it emptied into the Atlantic Ocean at the “Hillsborough Bar”, now the Hillsboro Inlet.